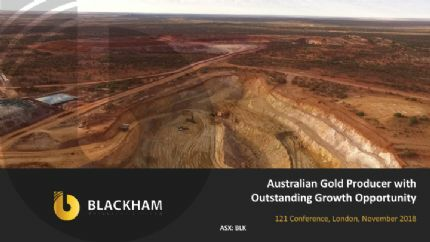 Sydney, Mar 21, 2019 AEST (ABN Newswire) - Blackham Resources Limited ( ASX:BLK) ( OTCMKTS:BKHRF) ('Blackham' or the 'Company') announces that it is offering eligible shareholders the opportunity to participate in a fully underwritten pro-rata renounceable entitlements issue of five (5) new fully paid ordinary shares in the Company (New Shares) for every four (4) shares held on the Record Date, which is anticipated to be 26 March 2019, at an issue price of 1.5 cents per New Share to raise approximately $25.8 million (before costs) ('Entitlements Issue'). 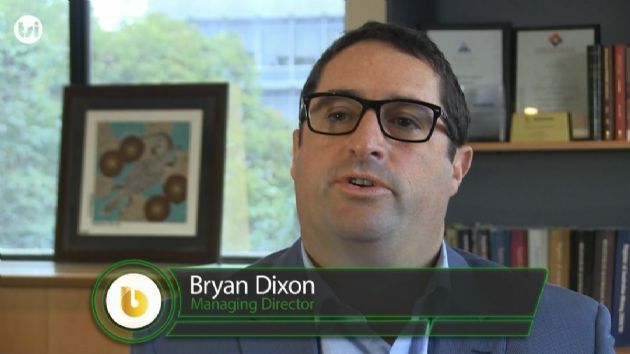 Blackham will issue one (1) free attaching option (Option) for every three (3) New Shares issued pursuant to the Entitlements Issue, with each Option being exercisable at 3.0 cents with an expiry date of 12 October 2020. 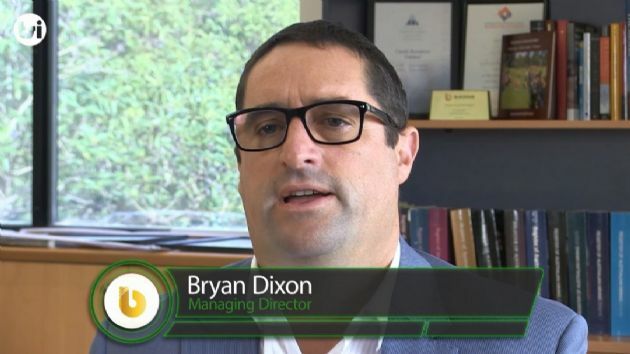 It is the intention of Blackham to list the Options on the ASX, subject to satisfying the ASX conditions for the listing of the Options. The Entitlements Issue price of 1.5 cents per New Share, represents a discount (not including the value of the 1:3 Options) of 44% to the last close price of 2.7 cents and 26% to the Theoretical Ex-Rights Price of 2.0 cents. The Company's financing providers, MACA Limited ('MACA') and The Lind Partners ('Lind'), have agreed to provide general sub-underwriting commitments in relation to the Entitlements Issue, totalling $10 million, where subscription moneys payable by each of MACA and Lind will be satisfied by a corresponding reduction in the amounts owed by the Company to them. As part of its commitment, Lind has also agreed to a standstill on any equity conversion under its converting note agreement below a price of 1.8 cents until 30 June 2019. Blackham's Executive Chairman, Mr Milan Jerkovic, has provided a sub-underwriting commitment in relation to the Entitlements Issue of $1.0 million in addition to committing to take up his rights pursuant to the Entitlements Issue of around $160,000. The remaining sub-underwriting commitments have been provided by a number of domestic and international institutional and professional investors. Hartleys Limited ('Hartleys') and Morgans Corporate Limited ('Morgans') were appointed Joint Lead Managers for the Entitlements Issue, with Hartleys being the arranger of the underwriting. 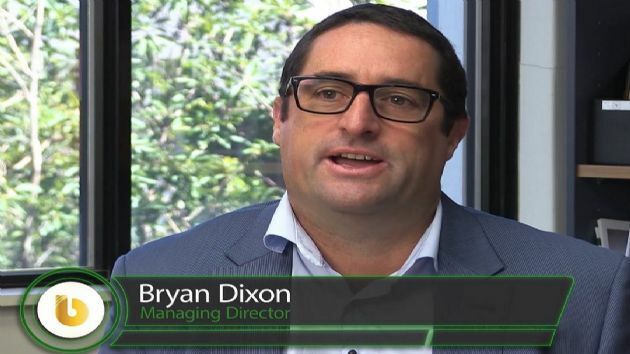 The Entitlements Issue is fully underwritten to $25.8 million, with an additional $5 million top up placement to sub-underwriters if there is strong demand from shareholders for the Entitlements Issue. The fully underwritten Entitlements Issue will strongly position Blackham to unlock the significant potential that Blackham has identified with the sulphide expansion opportunity at its 100% owned Matilda-Wiluna Gold Operation ('Operation'). 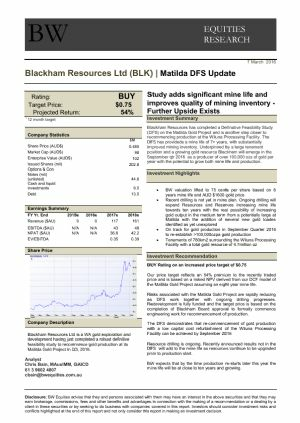 Blackham invites eligible shareholders to participate in the Entitlements Issue which will allow the Company to prioritise the completion of its Expansion DFS whilst also advancing related offtake and financing discussions with parties that are interested in the meaningful gold concentrate production that the Expansion DFS will achieve. The Company notes strong demand for marketable gold concentrates at present. Blackham is in discussions with various smelters and traders for both gold concentrate offtake and financing for the Stage 1 Expansion of its Operation. The Company will continue these discussions and keep investors informed. 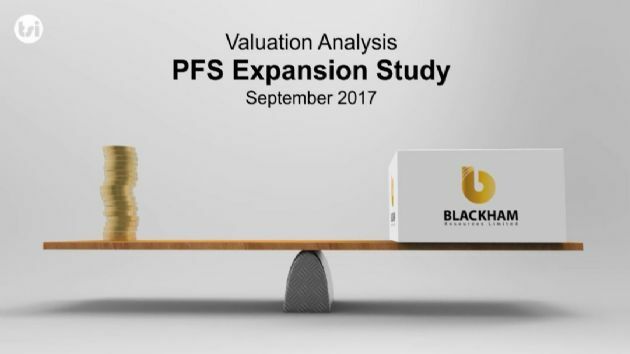 In addition, Blackham has engaged in initial discussions with a number of credible strategic investors regarding both financing and/or business combinations. The Company will continue to progress these discussions. Blackham has not received any written proposals from these strategic investors as yet and whilst discussions will continue, formal proposals may or may not be forthcoming. - ongoing working capital for the Company. To the extent that the number of shortfall shares ultimately allocated to each of MACA and Lind is less than each of their sub-underwriting commitments, the difference between the quantum of the underwriting commitment and shares allocated to each of MACA and Lind will be paid out of Entitlements Issue proceeds, such that the amount owed by Blackham to each of MACA and Lind will still reduce by $7.5 million and $2.5 million respectively upon completion of the Entitlements Issue. - Improved Plant Throughput: crushing circuit improvements aimed at increased performance and runtime. Refurbishment of the existing rod mill has commenced, which is expected to increase mill throughput by up to 22%. 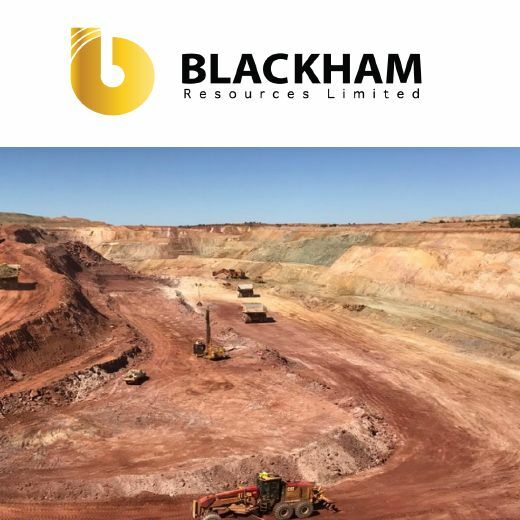 Drilling will continue to focus on Golden Age, Blackham's highest-grade free milling orebody, with a view to further extending the underground mine plan. Drilling is ongoing in the upper (GAN), middle and lower portions of Golden Age, to establish the sustainability of multiple mining areas within the orebody. Blackham is also planning to re-commence drilling in the West Lode area where it has discovered significant high-grade lodes that sit outside the underground mine plan. - Stage 1 Expansion: a proposed simple low capital addition of a flotation circuit to increase production to 100-120kozpa1. Stage 1 will also allow gold production from Blackham's large sulphide Reserves and provide flexibility to process both free milling or sulphide ores. - Stage 2 Expansion: proposed new comminution, flotation cells and leach circuits and a refurbished BIOX(R) Plant to increase ore processing throughput to 2.2-3.3Mtpa and gold production aimed at ~250kozpa1 with significantly lower operating costs (see ASX Announcement dated 28 February 2019). Eligible shareholders that take up their full entitlement under the Entitlements Issue may also apply for additional New Shares in excess of their pro-rata entitlement, subject to any scale-backs as determined by the Company and Joint Lead Managers. Entitlements (Rights) may only be exercised by eligible shareholders being persons with a registered address on the Company's share register in Australia, New Zealand and Panama. Ineligible shareholders are all those shareholders with registered addresses outside these jurisdictions. Entitlements may be sold on ASX from Monday, 25 March 2019 to Monday, 1 April 2019. It is the responsibility of purchasers of Rights to inform themselves of the eligibility criteria for the exercise of Rights. If holders of Rights after the end of the trading period do not meet the eligibility criteria, they will not be able to exercise the Rights. The Company's appointed nominee, Hartleys, will sell the Rights of Ineligible Shareholders, with the net proceeds if any, distributed to the Ineligible Shareholders. Further details in relation to the Entitlements Issue can be found in the prospectus released by the Company today (see link below).